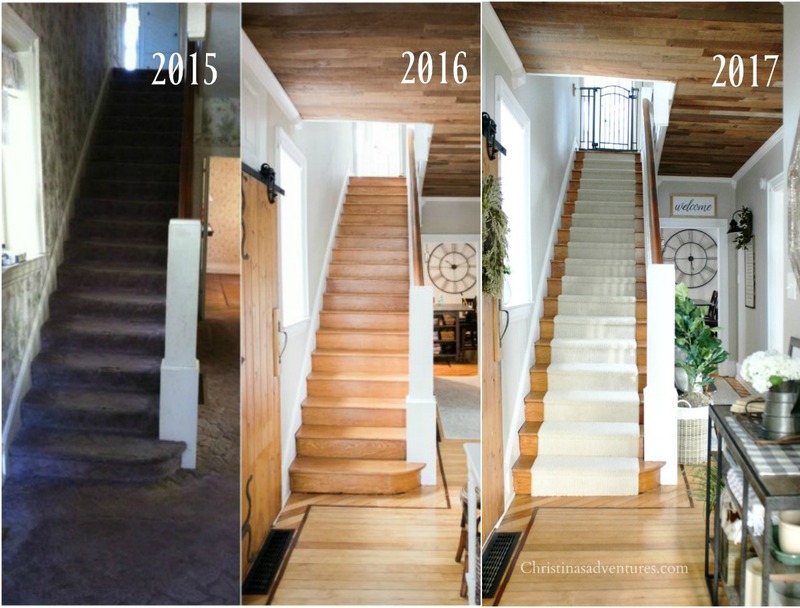 See the complete transformation of this fixer upper staircase makeover with a new stair runner. Affiliate links are included in this post – full disclosure here. I think I can finally say that the transformation is complete! Our hallway makeover has definitely been a marathon instead of a sprint, but it’s been well worth it. 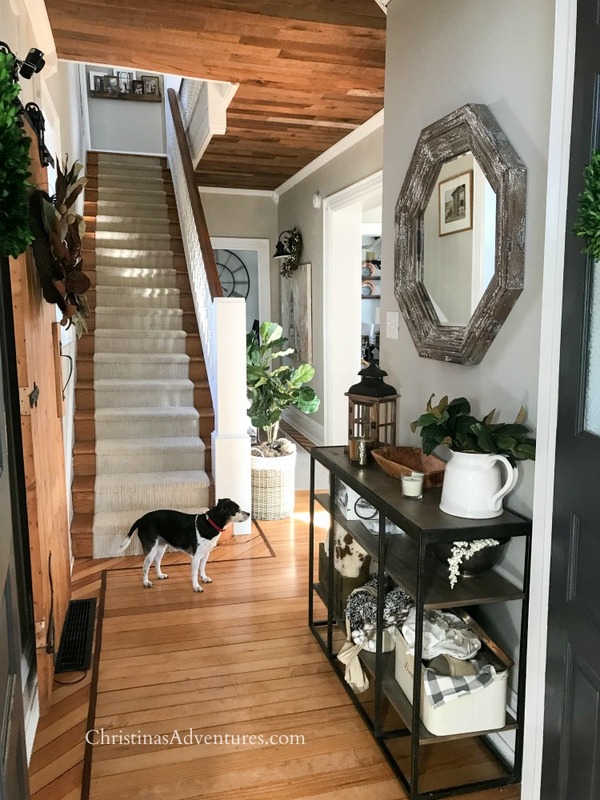 Today’s sponsored post is an exciting one – Carpet One Floor & Home® helped us make our beautiful hallway dreams come true! Anyone notice the biggest change? We are in LOVE with our new stair runner! It is such a big improvement in our hallway. It adds warmth, comfort, and a visual contrast to all of the wood tones in this hallway. I was worried about choosing carpet for our stairs, because we have two little kids, a dog, and a cat. That’s a LOT of wear and tear on these stairs! But since we found the Relax, it’s…Lee’s carpet, I feel so much better! It’s so durable – the 25 year stair guarantee really sold me! You can read more about why we chose this carpet in my first post. You can also read about how we loved buying our carpet through our local Carpet One Floor & Home® dealer in that post – they were wonderful! 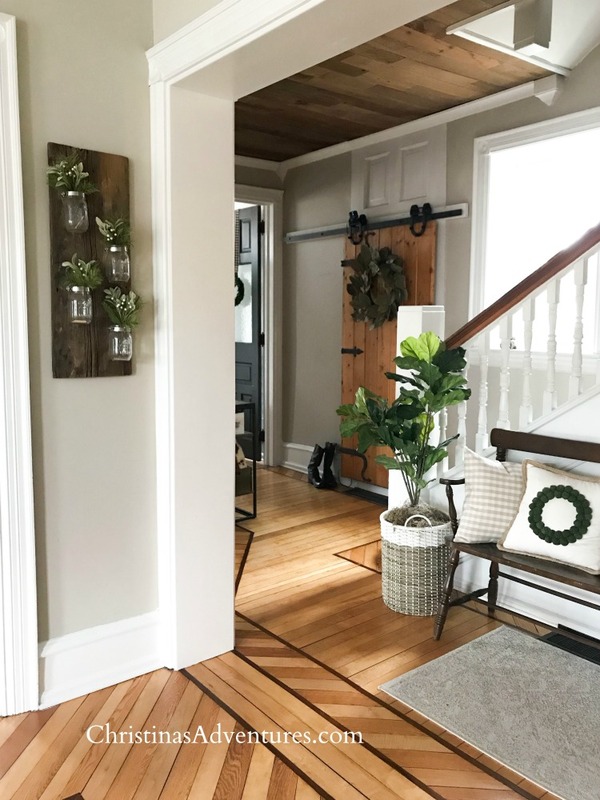 I also had fun accessorizing our hallway with some Homegoods finds, vintage treasures, and pieces I had around the house. I just love this table in our entryway! I even made my own (faux) fiddle leaf fig – tutorial here! The bench was a lucky Craigslist find. I’ll be sharing more pictures of that as time goes on too – make sure you’re subscribed to my newsletter (at the bottom of the post) to get all of the updates. PS we LOVE our runner and it’s surprisingly good at hiding dirt. I found it at a great price – shop it now by clicking here. I am in love with our completed hallway! Now, when I say that this makeover was a marathon and not a sprint, here’s the proof! I also get a LOT of questions about our paint color – it’s Revere Pewter. We love it – you can see all of our home’s paint colors in this post. This is a sponsored post written by me on behalf of Carpet One Floor & Home®. As always, opinions are all 100% my own and we LOVE our stair runner. Hi Christina! I have a similar staircase that needs covering. I either need to cover it or get new steps, the wood is really beat. I was wondering how you finished off the runner at the top of the stairs. Did you extend the runner down the hall (if there is a hall at the top of the stairs)?